Ramadan is our blessed and special month of the year that brings about some lifestyle adjustments. In our home, we try to keep Ramadan simple by not being extravagant and keeping our meals easy. 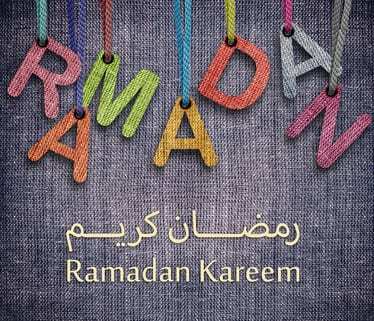 Ramadan only gets complicated when we focus on the worldly part of it, such as the food and entertainment, instead of the essence of it such as the worship and charity. Here are a few methods we use to keep Ramadan special yet simple with young children. We try to teach our children about the ibadah aspects of Ramadan in an easy and simple way. When children are young, it should not be too strenuous or cause them undue hardship, but rather it should be more a training for them with good memory attached. Explain the essence of Ramadan first and leave such things like waking them up for suhoor and keeping full days of fasting for later years. At iftaar time, we teach them the sunnah of breaking with dates and water, the dua for breaking their fast, and most importantly, to not over-indulge or be wasteful, nor extravagant with food. Truthfully, having all my kids wake up for suhoor can be quite hectic for me as a parent. Waking everyone up on time, preparing the breakfast and cleaning up, whilst trying to fit in some ibadah before sunrise can be quite challenging. To ease the strain at suhoor, we tell our younger kids to have their ‘suhoor’ at breakfast time. They still learn the lesson of restraint by fasting many hours. It is important for parents to remember (when they get frustrated by the lack of time for their own ibadah) that seeing to one’s family needs is an ibadah too. When we awaken everyone up for suhoor, reminding them to perform their salah, take care of little ones, prepare iftaar, and fast whilst keeping one’s patience and frustration in check is a big ibadah on its own! An important aspect that we work on during Ramadan is prayer. During the day, I welcome my children to pray with me and in the evenings when Daddy comes home, we pray as a family. Once again I keep this simple too. I stick to the aim of instilling a regular prayer habit into their lives and to teach them the blessings of praying in congregation. My older kids know how to make wudhu and I tell them to make their wudhu immediately after every bathroom visit, so they don’t delay the prayer time. My younger kids need more lenience, so they don’t make wudhu yet, but try to keep up with the habit of praying first. All of our kids, are taught the importance of having a clean body, clean clothes and a clean and tidy area to pray first. We also teach them some important aspects of prayer such as, how to behave during the adhan, being quiet and not fidgeting during their prayer, controlling their distraction, learning to concentrate, and how to find the qibla with a compass. Later they learn to memorize the iqamah, the number of rakaats in each prayer, then slowly we continue teaching the positions and supplications to them. Don’t do too much too soon, take it slow and steady and teach one thing at a time until they know it well. Our children learn that charity is not only about giving money, but also kindness through actions, deeds and mannerisms. During Ramadan we work on learning to smile more with one another, being patient with each other and spending more time helping little ones, the elderly and our neighbors. We ask them to try harder to control their arguments and pettiness with one another and to show tolerance and compassion towards their siblings. Guiding our kids and reminding them is the challenge for parents but keep the explanation simple and be an example yourself. Remember to accept the fact that children make mistakes and need constant reminders – that’s our job as parents! Start by teaching your kids to smile more, greet one another with true feeling and warmth, call their grandparents, uncles or aunts, write letters or draw pictures for mailing to loved ones, show better table manners, be extra clean, or make homemade treats and share with neighbors and family. Teach charity in all forms. My young kids listen to Juz Amma on a computer, CD or on an mp 3 player. My older kids are encouraged to read the Quran daily on their own. We have many moments of reading together, or I ask my older kids to read stories to their younger siblings from Islamic story books. Daddy will sometimes find an Islamic quiz online and quiz them in the last hour before Iftaar, so they don’t feel the last hour drag. I notice that when they compete for points, they enjoy the challenge and excitement and try harder to memorize their facts. We also listen to Islamic books on CD by authors such as Mehded Maryam Sinclair, Khurram Murad and Noor Kids. This also frees up some mommy time to do ibadah or preparations while the kids are engaged in blessed moments. In Ramadan we talk to our children about Allah’s Love and Mercy. We point out all the things that Allah [SWT] has given us and we explain to them how everything we have from our toys to our good health is from Allah [SWT] alone. We tell them about His infinite Mercy and how He forgives us over and over again for our sins. Our kids are encouraged to show mercy towards one another by forgiving their siblings when bothered, showing love and compassion to one another and appreciating each other by pondering a life without the other. They can do a role-play or put on a play for the family for reinforcement. We also observe nature a lot in Ramadan. When our children inspect the life of a tiny but intricate insect, they realize how truly magnificent Allah’s creation is. Science causes awe and amazement and when children are shown the details that make up the cycle of life, it is a beautiful way to teach them to love their Creator. As a parent of many kids, I have learned to keep things simple, not to overdo anything, or accomplish too much at one time. Children can amaze us by their fortitude, especially when they are impacted by a good talk and a parent’s example. Our children surprised us when we saw them abstain from their snacks and meals with no complaint to please their Lord, and all it took was sitting together and explaining the reasons and rewards. Try not to overwhelm yourself with trying to do it all in one Ramadan. Take small steps and use your judgement on how much you want to accomplish this Ramadan. Children learn quickly through repetition and reinforcement. Rather teach one thing well than many things too fast, too soon. I hope that sharing some of my Ramadan tips will help you have a productive Ramadan with your children. Ramadan Mubarak to you and your family from Muslimommy! Zakkiya, mommy of six who loves children, social interaction and organization. This led me to studies in those fields and becoming an elementary teacher. Now I homeschool my children and try to assist others to cope with a busy life in a simple and wholesome way. I believe success as a Mu’meen, is by sharing our ‘ilm, caring for the ummah and preparing for the akhira. I publish articles regularly on www.muslimommy.com , and interact often on www.facebook.com/Muslimommy . I also publish a childrens magazine with my kids at www.muslimkidsdigest.com whenever possible.